My fellow blogger Sandy gave me the heads up on this incident. She found it originally, on doing research into the life and times of Alexander Wyllie, and mentioned it in the comments to this post on the history of electricity in Auckland. The images in this post are Sandy's, by kind permission. From Auckland Star, 14 July 1917. 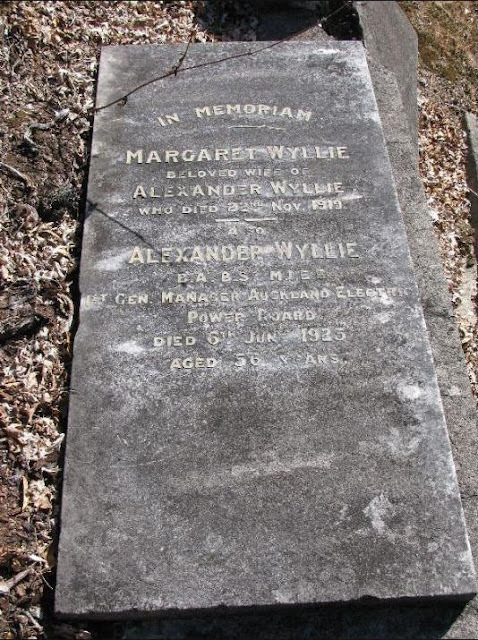 Alexander Wyllie, chief electrical engineer, Ascot Avenue, Remuera. Hands and face burned. William Purcell, station superintendent, Halesowen Ave, Edendale. Severely scalded. Henry Pearson, shift engineer, 31 Argyle St, Morningside. Scalded hands, face and leg. William Albert Oram, greaser, 4 Fitzroy Street, Ponsonby. Scalded face, hands, forearms and legs. Messrs Wyllie and Purcell were taken to their homes, and Messrs Pearson and Oram were sent to the hospital. An examination of the engine was made this morning, but no definite cause could be found for the accident, which is considered to be of an unprecedented nature. The engine in which the blow-out occurred is an ordinary triple-expansion vertical stroke type, developing 820 horse-power, coupled to an electric generator. The machine had been in use for five years, and hitherto had given no trouble whatever. The portion of the engine in which the explosion actrually occurred contains the pistons and driving shaft cranks. In the bottom of this chamber a large quantity of lubicating oil collects, and it is thought possible that it was the effect of overheated bearings on the oil that caused the explosion, but until the whole of the engine is dismantled and thoroughly examined, the cause cannot be definitely explained. The force of the explosion violently blew off and smashed the steel lid of the crank chamber, and shattered a solid iron bracket supporting a platform around the upper portion of the cylinders. The scalding-hot oil was thrown up against the bottom of the platform, and descended in a shower on the four injured men, who were engaged near the machinery. There will be no interference witrh the supply of current. The plant of the power-station includes four main engines and a turbine generator, and an ample supply of power will be available without the damaged engine. 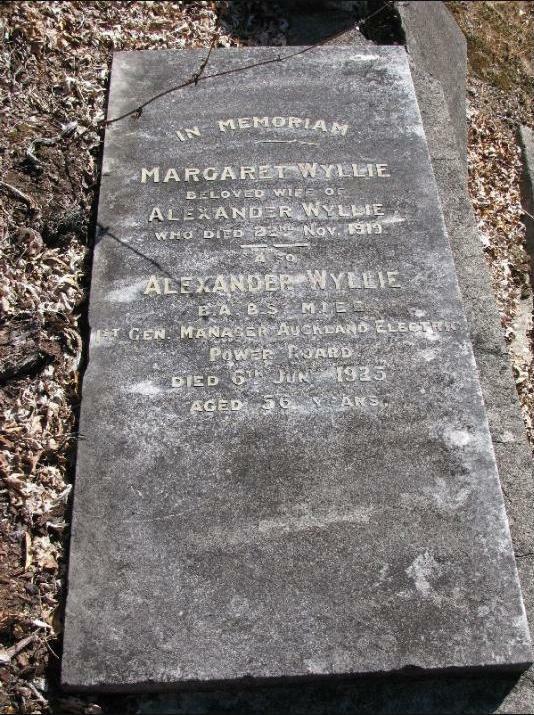 Alexander Wyllie went on to become the Auckland Electric Power Board's first general manager and engineer from 1922. Unfortunately, he didn't live long enough to see the new power board develop its full potential. From the Auckland Star, 6 June 1925. Ten days ago, when he completed his annual report to the Auckland Electric Power Board, Mr Alexander Wyllie, the general manager, remarked, "Thank goodness, that is finished. I am going to have a rest." Mr Wyllie, who had been in poor health for some time past, then went home to bed, and did not leave it again, passing away last evening. Born in Adelaide 55 years ago, Mr Wyllie went to Great Britain as a young man to complete his education, and he studied and worked under eminent engineers. He received an appointment as borough engineer of Walsall, Staffordshire, a position which he held until 1907, when he came to Auckland as Auckland city electrical engineer. He supervised and controlled the establishment and extension of the present electrical undertaking in Auckland, the first section of the plant being opened in 1908. The extensions that have since been made place the King's Wharf station in the front ranks as the most efficient steam-electric plant in the Dominion. Mr Wyllie visited Great Britain in 1920, when it had been decided to add to the then existing plant, and he selected much of the machinery installed during the last two or three years. He was appointed general manager shortly after the Auckland Electric Power Board was constituted in 1922. Mr Wyllie was a member of the Institute of Electrical Engineers. He held an MA degree, and could speak several languages. On a number of occasions he lectured on scientific subjects before the Auckland Institute, of which he was a member. He was a member of the Rotary Club in Auckland, and until recently was associated with the French Club. Mr Wyllie is survived by one daughter. The esteem with which the late Mr Alexander Wyllie, general manager of the Auckland Power Board was held was demonstrated by the large number who paid him a last tribute of respect at the funeral yesterday. St Aidan's Church, Remuera, was filled at 2.30 pm when a short service was conducted by the Vicar, Rev J Wilkinson. The chairman, members and staff of the Power Board were present, also representatives from various local bodies, and the Mayor of Auckland, Mr George Baildon, with members of the City Council. As the casket was carried from the church all present stood, and the "Dead March" in "Saul" was played by the organist. About 40 motor cars followed the hearse to Purewa Cemetery. The King's Wharf power station, with which Alexander Wyllie was closely associated with during his career in Auckland, was demolished in 1971. 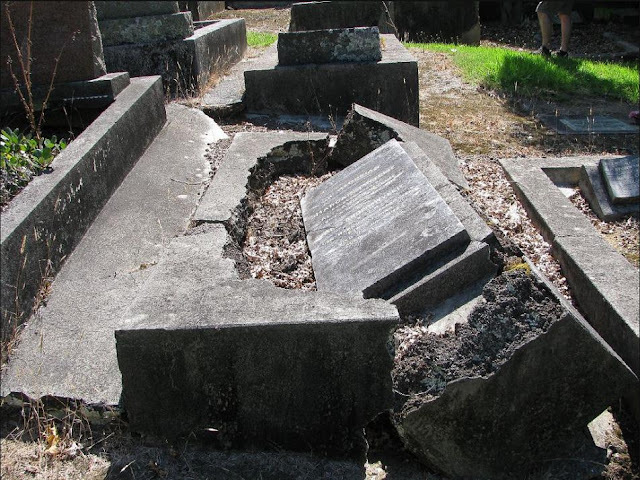 Perhaps someone should contact Mercury Energy, the successor to the Auckland Electric Power Board, and ask if they have some dosh available to help restore Mr and Mrs Wyllie's grave, seeing as he was a pioneer of our electricity system. Once again, my thanks to Sandy for permission to use her images here. Seeing as Liz has had to prod others about Carbine's head, might be the time to poke others? Bearings usually overheat because of lack of oil. I think it a bit of a chicken and egg problem. I do so like the the words 'violent explosion'. I will use them in the future. And of course the power company should pay for grave restoration. I can see the great publicity headline in the Herald now. Reckon you're right, Jayne. It does look like things went boom. Ohhh lookie there! Some extra digging Lisa...good stuff! It is a really weird sort of grave collapse. Looks like the Wyllie's had had enough of each other and one was trying to break out LOL. Ground subsidence i would say but does appear to have had the concrete broken for a subsequent interment to maybe have taken place. The Purewa Cemetery database doesn't appear searchable by plot which is a shame [Christchurch cemetery database is one which enables this to find burials connected to a plot]. Searching the Purewa database for all the Wyllie's [and spelling variants], I can't find anyone else with their surname at least. awww thanks for the nice comment Jayne! I'm in full agreeance, we should type up something and put it forward to the power company. http://sarndra.com/begg.html [i have to update that page as yet].